Right now, there are backpackers crossing into Canada after five months of hiking the Pacific Crest Trail. They're called thru-hikers, and they started the trail in Mexico and will traverse 2,650 miles. Now, the lazy among us might have just read "Wild," Cheryl Strayed's memoir about the Pacific Crest Trail. The even lazier among us may be waiting for the movie to come out in December. The hikers who actually make this trek see toenails fall off and their feet can swell whole shoe sizes. They say the only thing they talk about more than their feet is food. After hiking 1,000-miles of their journey, food is what Silicon Valley engineer Hank Magnuski will have waiting for them. 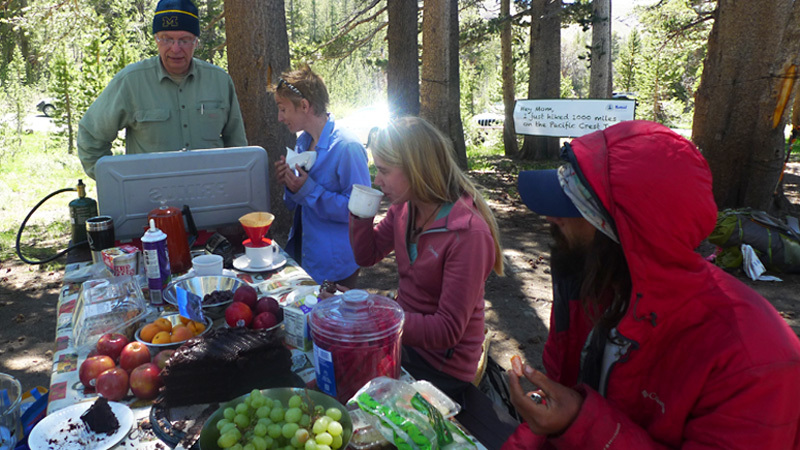 Once or twice a year, he sets up the Sonora Pass Cafe, a pop-up feast he provides at no cost for those hiking past. Shopping at a Costco, Hank Magnuski picks up five packs of chocolate chip cookies and eyes a chocolate cake that's 7 inches high, a foot across, and covered with icing and shaved chocolate flakes. "I can go through a cake like this in about a day," he laughs. He heads to the fruit section, piling packages of cherries, apricots and bananas into his cart. "Bananas have a lot of nutrients. 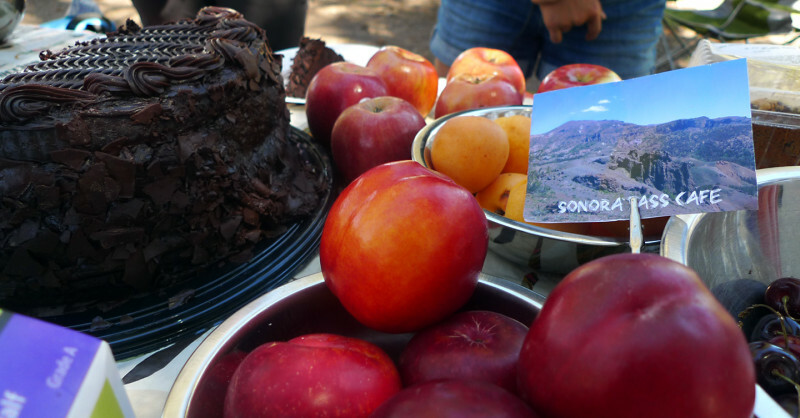 It's a favorite hiker food." If you Google Magnuski, you'll learn that he's kind of a big deal in telecommunications, but that's not going to matter to the people he's shopping for. After he leaves, he'll head out to the Pacific Crest Trail -- known as the PCT -- and wait for a herd of hikers. While Magnuski shops, unsuspecting hikers trek a really beautiful but tough patch of the PCT south of the Sonora Pass. It's deep wilderness. Within a 300-mile stretch, there's only one road -- Yosemite's Highway 120 -- that crosses the PCT. For a week, hikers scale a steep pass every day, with some peaks as high as 14,000 feet. They hike past lakes, dip into deep canyons and pass by granite cliffs, in wilderness areas with famous names, like Emigrant, Yosemite and John Muir. They face swarms of mosquitoes, unpredictable weather and snow, even in this drought year. One hiker is Shannon Pepper -- trail name Pan -- from Missoula, Montana. The recent college graduate sings to lift her spirits on the trail. Pan says hikers typically leave the trail every five days or so to shower and restock their food. It's mostly dried and dehydrated to keep their packs light. "When you're on trail and you're carrying all your own meals, it can get really scary when you are close to being out," Pepper says. "I feel like I have a little better perspective on what it really means to be hungry. We live in a society of plenty, and there isn't plenty when you have to carry all of it." Plenty is exactly what Pan finds, when she walks into a picnic area where Hank Magnuski is waiting with a table full of all that food from Costco. As every hiker approaches, he says, "I'm The Owl. I'm your host here, help yourself." This is the Sonora Pass Cafe. Magnuski sets it up when he knows there will be a lot of PCT traffic. In the three days he's here this time, 50 hikers come through, with trail names like Gottawalk, Pesky, Laugh Track and Park. None of them expected this. Laugh Track is too distracted to talk to a reporter. "Oh, I just got a cookie with a cherry on top. Magic!" She and friends take selfies with the signature Sonora Pass Cookie. Pesky says, "There's a chocolate cake you can't even imagine on the trail." Pan can't get over the high-quality beer or the Wi-Fi that Magnuski set up. "Currently I'm blogging," she says, incredulously. Magnuski lays out china and bowls of fruit on a tablecloth. He arranges camping chairs and newspapers. On a nearby tree, he hangs a dartboard he calls "Hikers Revenge," with a picture of a mosquito in the middle. Park is delighted. "There's totally a mosquito on the dartboard! All right, I'm going to stick it to you for sticking it to me!" Magnuski doesn't say much, but smiles broadly as he brews gourmet coffee on a portable stove. "The PCT folks, they're doing 25 miles a day. It's like a marathon every single day for six months. Trail magic helps alleviate the pain." 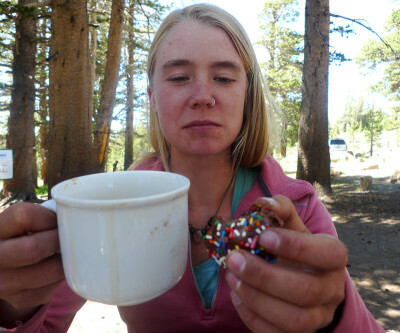 Trail magic is any help or treat offered to PCT hikers. Trail angels provide water, or free rides, or hiker-friendly food like what Magnuski presents at the Sonora Pass Cafe. There's a really experienced hiker here today: Marsha Powers (trail name Gottawalk) from the Bay Area town of Pleasanton. She's thru-hiking the PCT for the third time, solo this time, after completing the Continental Divide Trail, the Appalachian Trail and the cross-country American Discovery Trail with her husband. "Trail magic is serendipity. You don't hike along expecting to reach Sonora Pass and be fed wonderfully like The Owl did for us today," she says. "As a hiker, I don't think that I expect it or deserve it, but I'm thankful and grateful for it when it happens along." So, what does it do for a hiker to come across a surprise like this? "Connection with the outer world is part of it. Calories are part of it, because we hike along with calorie deficit," she says. "It reinforces one of the major lessons that we've learned, that the people are good, kindhearted people, in spite of all the news that you read and hear. I think that's very reaffirming." Magnuski says he considers it an honor to be out here. He discovered the Sierra nearly 20 years ago, chaperoning his son's Boy Scout trips. "I grew to love the mountains. It's really my cathedral out here. I got involved in trail work when he went to college and I had no one to hike with." Magnuski joined a trail crew maintaining this section of the PCT, and realized how barren the Sonora Pass is, even this picnic area. "There's nothing here but trees and a privy. The thought of a full-blown cafe in the middle of the wilderness seemed like a neat idea," he says with a laugh. So, 10 years ago, he hosted his first Sonora Pass Cafe here. Now he's spraying whipped cream onto a cookie and handing it to an exhausted Cat Addison, trail name Cat Dog. She's from Bend, Oregon, and she hasn't come down off the trail to rest or replenish her pack in nine days. "When I got to the trailhead and saw this little sign that there was trail magic, I started to cry," she says, with relief in her voice. "I was so tired. I'm so glad to be here." Addison is 62. Plenty of other hikers are 40 years her junior. 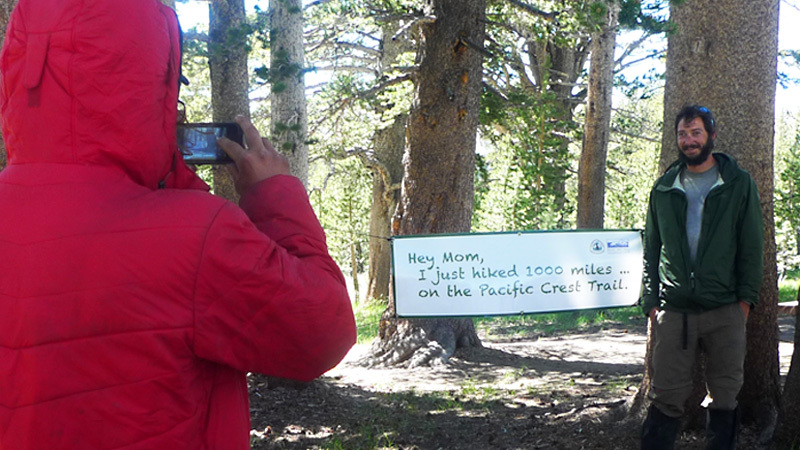 A decade ago, she hiked the Appalachian Trail, but she's thru-hiking the PCT for the first time. "The Sierras have kicked me around a little bit. I mean I've had a couple meltdowns, a couple face plants, that didn't feel too good," she says with a laugh. "But people say the trail provides, and sometimes it does." Gage Waffle nearly ran out of food on the trail and is gorging on whipped cream, cake and carrots. He's from Tulsa, Oklahoma, and he's in his 20s. He was working on a gas pipeline when a buddy called and proposed they hike the trail together. "I didn't ask any questions. I just said, 'I'm in,' " he says. Three weeks before their start date, his friend backed out. "So I decided to come alone. I'd never really done anything, been out on an adventure on my own, so I was kind of terrified at first. This whole experience has just taken all that away, allowed me to not worry about things that could go wrong, but just enjoy what's going right. Like this right here, at Sonora Pass." Now, there's color in the cheeks and light in the eyes of the hikers as they throw on their packs, and head out for a few more hours on the trail. Before they leave, they give a big cheer for Magnuski and his trail magic. He wishes them luck on the rest of their journey, congratulates them on their first 1,000 miles and says, "That's your last 10,000-foot peak up there. It's all downhill from there." California Foodways is made possible with support from Cal Humanities, a nonprofit partner of the NEH. Visit www.calhum.org. Vickie Ly did additional reporting for this piece.